It’s often said that the MINI is the go-kart of the small car fraternity, but we’d like to present a new nomination for that title: the Abarth 500 Esseesse. The famous Abarth name is today found on Fiat’s performance-oriented vehicles, and in the case of the Abarth 500 Esseesse the scorpion badge is proudly prominent both inside and out. Of course, the 500 Esseesse is based on the humbler Fiat 500, itself a retro nod to the famous Italian microcar of the 1950s. In terms of pulling off a modernised depiction of a classic, we think the design hits the mark- it’s cute and characterful without being cheesy. Under the bonnet (unlike the original rear-engine 500, the current vehicle has its engine mounted in the front) lies a breathed-on version of the 1.4-litre four-cylinder unit found in the Fiat 500 and Alfa Romeo MiTo. Turbocharged, the petrol-fuelled power plant cranks out 118kW and 201Nm torque, with 230Nm available when the sport button is pressed. Combined with a five-speed manual transmission and a kerb weight of only 1035kg, the 500 Esseesse can hit 100km/h in 7.4 seconds while consuming 6.5 litres of fuel per 100 kilometres on the combined cycle. Pleasingly, the car can run comfortably on 91-octane fuel, unlike many modern cars which require a 95-octane minimum. As well as the coupe, there is a soft-top cabriolet version known as the 500C Esseesse. This swaps the manual gearbox for a tricky five-speed automated manual and gains Koni shock absorbers as standard (they are optional in the coupe). Finally, there is the coupe-based Abarth 695 ‘Tributo Ferrari’ which has a 132kW version of the same engine, is packed with extra, higher-quality equipment, the automated manual gearbox, carbon fibre trim, leather/alcantara seats and the all-important Tributo Ferrari badge. 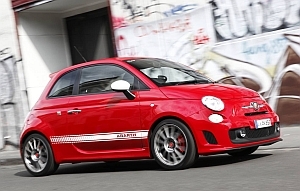 For this review, Private Fleet recently sampled the Abarth 500 Esseesse in coupe form. Optioned with the quad exhausts from the Tributo Ferrari version, it makes for a raucous, engaging driving experience. In 2013 this remains a diminutive car, yet still the design is eye-catching. The inside provides an immediate contrast, for the front seat location is very high and makes you feel like you are sitting on top of the car, rather than in it. The seats themselves are comfortable enough, and there is a surprising amount of room in the back for the kids. The chunky steering wheel is adjustable for tilt-only, but the way the hand falls to the high-mounted gear shifter makes up for that. All controls are easy to modulate, the clutch with a high bite-point, the brake pedal with a beautiful progression to it and a throttle pedal placed perfectly to allow heel-and-tow down-changes for those racy types. There is a noticeable lag in equipment when compared to rivals, with only a five-speed manual, no parking lights, no satellite-navigation, one-speed intermittent wipers and the non-reach adjustable wheel, though Bluetooth connectivity and the usual suite of safety features are all present. Underway the Abarth 500 Esseesse is immediately firm in its ride; in fact, it is amongst the firmest road cars I have ever driven- the ‘go-kart’ phrase has never been more appropriate for a road car. Larger deflections are a jolting experience however the damping retains good body control, returning you to a state of equilibrium quickly. The trade-off for this sometimes uncomfortable firmness is very flat cornering, with loads of grip available on smooth surfaces. The engine’s response to throttle feels a little damped until you press the sport button on the console, at which point the 500 Esseesse comes alive under a swell of torque that belies the engine’s small capacity. It’s at its happiest from 3000-5000rpm where the boost gauge swings to over 1.2-bar of pressure. With a redline of 6000rpm anyway, it’s more of a slugger than a screamer. There is some exhaust drone in the cabin, but the pay-off comes on the open road where the engine pops and crackles on the over-run…it’s a lot of fun. Another button on the centre console will also be essential should you enjoy sporty driving. Labelled ‘TTC’, the torque transfer control system acts like an electronic differential lock for the front wheels, sensing any traction loss and braking the spinning wheel to provide exceptional traction out of tight corners. While the steering is light and direct there isn’t much feedback through the wheel. The gearshift can feel a bit rubbery, but familiarity sees you slotting home gears with confidence. Braking, in the meantime, is exceptional. With rivals undercutting the Abarth on price (such the Skoda Fabia RS, Volkswagen Polo GTI), new hot hatches like Opel Corsa OPC and upcoming Renault Clio 200, the Abarth has its work cut out for it, but its combination of funky retro styling, good performance and character make it a unique proposition in this class. For any more information on the Abarth 500, or for that matter any other new car, contact one of our friendly consultants on 1300 303 181. If you’d like some fleet discount pricing (yes even for private buyers!) we can submit vehicle quote requests out to our national network of Abarth dealers and come back with pricing within 24 hours. Private Fleet – car buying made easy!